Christopher Balme opens his investigation into the theatrical public sphere with a fascinating example of an event put on by the Munich Kammerspiele in 2012. The city’s municipal theatre had invited citizens to take part in an open air meeting conducted at one hundred tables set up on exclusive Maximilianstrasse just outside the theatre building. Each table was assigned a topic for discussion. The theatre’s invitation asked participants to turn this meeting into a centre for public debate asking ‘what does it mean to be poor and rich in Munich?’ (p.2). Now, repoliticising theatre and performance has been much discussed recently but most commentators still assume that theatrical events still take place on stage in front of an audience gathered in a theatre building. The Kammerspiele, however, took this approach a step further by moving out of the confines of the theatre building to use the public sphere itself as a stage. It is these kinds of interventions in which Balme is interested, as they link to Jürgen Habermas’ theory of the public sphere as a discursive space in which the public can engage in political debate on equal terms (1989). The author places his discussion on the border between public and private, arguing that the still-prevalent bourgeois theatre model had turned it into a private space ‘at the cost of theatre’s very publicness’ (p.3). Balme sees a way out of this dilemma but only if the theatre finds ‘strategies to connect established institutional practices with the rapidly changing dynamics of the public sphere in its new media manifestations’ (p.21). 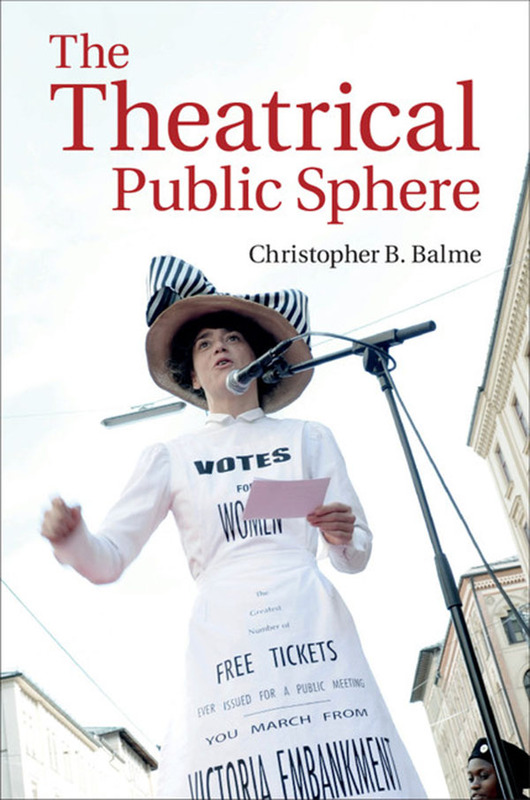 In the book’s first chapter, Balme locates the term of the theatrical public sphere. With admirable ease he discusses examples from different centuries, countries and commentators, focussing on the distinction between private and public. He pays particular attention to ancient Greek performance practice as constituting an early form of the theatrical public sphere (pp.28–36). The book’s second chapter concentrates on mediatised communication as Balme discusses the interconnections between theatre and the media. Again, he covers significant historical ground here by starting with early examples of playbills during the seventeenth century, leading up to Twitter, Facebook and blogs. His discussion of the German online review portal nachtkritik.de illustrates the serious debates around ownership of the public sphere in cyberspace (pp.71–73). In Chapter 3, Balme turns to a specific historic example when referring to the closure of theatres in England between 1642 and 1660 as ‘perhaps the first instance of a genuine theatrical public sphere, understood as an arena of debate conducted in countless pamphlets and tracts, on the stage and off, in courthouses and churches’ (p.75). Balme specifically refers to the anti-theatrical discourse leading up to the permanent closure of playhouses in 1649, a discourse—as he points out—which was quite diverse and cannot be simply labelled ‘Puritan’ (pp.76–77). Chapter 4 continues with the issue of religion but puts it in a global context. In this section, titled ‘The prophet onstage: theatre, religion and the transnational public sphere’, Balme refers to events in which depictions of the prophet Muhammad onstage and in print sparked global protests. Here the author establishes a fascinating link between two late nineteenth century productions of plays portraying Muhammad in London and Paris, which were cancelled due to international protests, and a 2006 production of Idomeneo in Berlin which was initially taken off the programme and then reinstated due to public pressure. The 1889 production of Henri de Bornier’s play Mahomet in Paris and its British production a year later were widely discussed and caused frictions and diplomatic irritations not only in Europe but also further afield. Ultimately, the productions were ‘sacrificed on the altar of realpolitik’ (p.127). In 2006 Berlin, however, a similar sensitivity was not displayed, Balme claims, with the ‘politically enforced’ performances of Idomeneo, which in Hans Neuenfels’ production used the decapitated head of Muhammad as a prop on stage. In dealing with these two instances Balme also observes a shift in the relationship between theatre and the public sphere. In late nineteenth century Paris and London, the theatre was seen as having a potentially decisive influence in the public sphere, whereas with the Berlin Idomeneo the performance itself was hardly recognised and failed to contribute to public discourse. Balme acutely observes ‘the somewhat depressing irony […] that it took a non-performance to actually re-establish contact between the theatrical and the political public sphere; the production itself singularly failed to do this’ (p.138). In Chapter 5, Balme more generally discusses thresholds of tolerance and the publicity of scandal as ‘theatre scandals and controversies represent perhaps the most prominent points of articulation between performance and the public sphere’ (p.140). He particularly refers to Weimar Germany, which saw unprecedented levels of scandals and riots in the wake of abolishing theatre censorship after 1918, but he also looks at a more recent example by Italian company Societas Raffaele Sanzio who were accused of blasphemy by Catholic pressure groups. He rounds off the chapter with another recent example from Berlin, where blackface caused protests exemplifying the ‘corrective’ power of the public sphere, which increasingly used social media to organise opposition (p.172). Balme concludes with a somewhat more positive outlook discussing recent attempts to reintegrate the public sphere with performance particularly using new media and relating to notions of ‘postdramatic theatre’ as defined by Hans-Thies Lehmann (2006). The author usefully discusses Christoph Schlingensief and his influential public performance Please Love Austria, which took place in Vienna in 2000, as well as Rimini Protokoll’s 2005 piece Call Cutta, among others. Overall, Balme presents us with a fascinating tour-de-force, although his findings may be slightly limited in that his examples are not only Eurocentric but really almost entirely relate to Britain and Germany. On the other hand, he is not only able to unravel a persuasive argument and extend Habermas’ theory to performance, but by doing so he also questions the very fabric of the theatre and the way it operates. Habermas, J., 1989. The structural transformation of the public sphere: an enquiry into a category of bourgeois society. Translated by T. Burger and F. Lawrence. Cambridge, MA: MIT Press. Lehmann, H.-T., 2006. Postdramatic theatre. Translated by K. Jürs-Munby. London: Routledge. Anselm Heinrich is Lecturer and Head of Theatre Studies at the University of Glasgow. He has published on different aspects of German and British theatre history, including two monographs on Entertainment, Education, Propaganda. Regional Theatres in Germany and Britain between 1918 and 1945 (London: University of Hertfordshire Press, 2007), and Theater in der Region: Westfalen und Yorkshire 1918 bis 1945 (Paderborn: Schoeningh, 2012). He is currently under contract from Routledge for a book-length study of European theatre under Nazi occupation. Other recent publications include a collection of essays on Ruskin, the Theatre, and Victorian Visual Culture (co-edited with Kate Newey and Jeffrey Richards and published by Palgrave in 2009) and journal articles in New Theatre Quarterly, Theatre Survey and Theatre Research International.